We’d love your help. Let us know what’s wrong with this preview of Rendezvous Eighteenth by Jake Lamar. Rendezvous Eighteenth marks the emergence of an exciting voice in crime fiction. Ricky Jenks gave up life in the U.S. years ago and is content, if not happy, with his life as a piano player in a small café in the Montmartre neighborhood of Paris. He has many friends among the other African-Americans living in Paris and is happily, if casually, involved with a French Muslim Rendezvous Eighteenth marks the emergence of an exciting voice in crime fiction. Ricky Jenks gave up life in the U.S. years ago and is content, if not happy, with his life as a piano player in a small café in the Montmartre neighborhood of Paris. He has many friends among the other African-Americans living in Paris and is happily, if casually, involved with a French Muslim woman. To ask other readers questions about Rendezvous Eighteenth, please sign up. 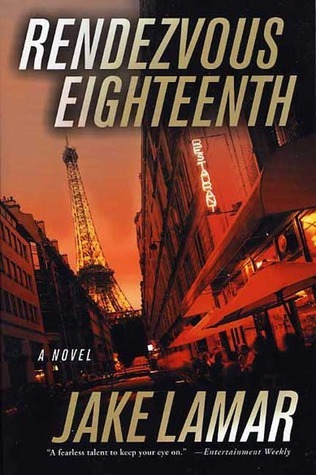 Jake Lamar's Rendezvous Eighteenth is set in modern day Paris's Eighteenth Arrondissement, a beautiful and decadent section of town that underachieving African American Ricky Jenks has chosen to call home for the past ten years. Ricky is leading a carefree bohemian lifestyle as a musician in a small café until his peaceful existence is interrupted by a desperate phone call from his least favorite cousin, Cassius, a renowned surgeon to the NFL and NBA athletes. Cassius is looking for his wife (Se Jake Lamar's Rendezvous Eighteenth is set in modern day Paris's Eighteenth Arrondissement, a beautiful and decadent section of town that underachieving African American Ricky Jenks has chosen to call home for the past ten years. Ricky is leading a carefree bohemian lifestyle as a musician in a small café until his peaceful existence is interrupted by a desperate phone call from his least favorite cousin, Cassius, a renowned surgeon to the NFL and NBA athletes. Cassius is looking for his wife (Serena) who has fled to Paris after a heated domestic dispute and offers Ricky a thousand dollars to look in his expatriate circle of friends for clues to her whereabouts. Good-natured Ricky is immediately drawn into a quagmire that results in him being a suspect in the murder of a transvestite prostitute found in the lobby of his building with keys to his apartment. Complicating matters is the pregnancy of his French Muslim lover, Cassius's strange business dealings and partners, and the enigma behind Serena's cryptic past and reemergence in Paris. If you love books set in Paris or want to learn more about Black Americans living there in the 90's, this is the book for you. The neighborhoods where many congregate, interesting markets and cafes in the less touristy parts of Paris, Montmartre, and more are brought to life in this novel that offers a nice visual display that forms a panorama in the reader's mind. I couldn't give it 5 stars but it is refreshingly different and a decent thriller. Recommended to Titilayo by: GoodReads News Letter? i am disturbed. not in a giovanni room's way, just disturbed by the ending. i was expecting something more substantial. i liked the portrait into the expatriate and immigrant community in paris *albeit a fiction one*. guess you could say i'm more disappointed than disturbed. but i'm willing to give jake lamar the benefit of my loyalty since he did literally follow in the footsteps of james baldwin! A good friend who lives in Paris recommended this mystery and writer. Lamar created an atmosphere so real the reader feels like walking those streets of Paris. The story is based on an African American male's experience, so that was a modern twist and extremely accurate. The story has a lot of twists and surprises, backed up by smooth writing. The book started off well, I was interested. Then, it bogged down in the middle. The end had too much going on. All in all, I love anything having to do with Paris, but not much of a story line. A really likeable hero. Great action and character development.